As one of the world’s leading manufacturers of wheelchair ramps, AlumiRamp engineers and manufactures deliver a full line of ramps designed to promote active lifestyles for people with limited mobility. 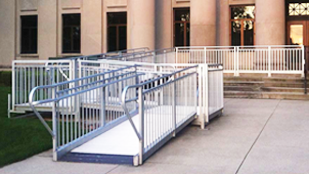 AlumiRamp pioneered the first modular aluminum ramp system in 1986 and now offer four lines to meet your exact needs, from the smallest threshold to the highest porch. Handrails, landing platforms, step systems, and custom designs are also available. AlumiRamp delivers quality, service, and dependability with all of our ramp products, proudly made in the USA of recycled aluminum.